Born: Johannesburg, South Africa, of British parents, 13 June 1892. Education: Attended Repton School, England. Family: Married 1) Ethel Marian Forman (divorced), one son; 2) the writer Ouida Bergere, late 1920s, daughter: Cynthia. Career: 1911—worked briefly for Globe Insurance Company, Liverpool; joined stage company of his cousin, Frank Benson: stage debut in The Taming of the Shrew in Liverpool; 1912—U.S. stage debut on tour with Benson's Shakespearean company; 1914—London stage debut in The Sin of David ; 1916–19—served in Liverpool Scottish Regiment: Military Cross; 1921—film debut in Innocent ; 1925—U.S. film debut in The Masked Bride ; 1933–34—played opposite Katharine Cornell in The Barretts of Wimpole Street and Romeo and Juliet ; later stage roles include work in The Heiress , 1947, Julius Caesar , 1950, and The Gioconda Smile , 1950; 1939—played Sherlock Holmes in the first of a series of films, The Hound of the Baskervilles ; also played Holmes on radio for seven years, and acted in the radio series Scotland Yard , 1947, and the serial Tales of Fatima , 1948; 1950—narrator with Philadelphia Orchestra in The Nightingale and the Rose ; 1952—host for TV series Your Lucky Clue . Died: 21 July 1967. Interview by L. Soule, in Motion Picture Magazine , July 1936. Interview by F. Baird, in Photoplay , August 1936. In and Out of Character , New York, 1962. Thomas, Tony, Cads and Cavaliers , South Brunswick, New Jersey, 1973. Druxman, Michael B., Basil Rathbone: His Life and His Films , South Brunswick, New Jersey, 1975. Richards, Jeffrey, Swordsmen of the Screen: From Dougas Fairbanks to Michael York , London, 1977. Current Biography 1951 , New York, 1951. Obituary in New York Times , 22 July 1967. Maltin, Leonard, "Basil Rathbone," in Film Fan Monthly , September 1967. Cutts, J., "Superswine!" in Films and Filming (London), March 1969. Gires, Pierre, "Basil Rathbone," in L'Ecran Fantastique (Paris), December 1970. Henderson, Jan Alan, "The Stories of Sherlock Holmes," in Filmfax (Evanston), February-March 1992. Seymour, Blackie, "Pentagram Revues," in Classic Images (Muscatine), February 1995. Norman, Barry, in Radio Times (London), 18 March 1995. Marias, M., "Basil Rathbone," in Nosferatu (San Sebastian), January 1996. Potes, A., "Basil Rathbone," in Nosferatu (San Sebastian), January 1996. Basil Rathbone's film career is a lengthy one, spanning 45 years. During this time he played a variety of roles, both on the screen and stage, and he prided himself on his versatility. Nevertheless, Rathbone often found himself at the mercy of producers who typecast him within a limited range of characters. In the earliest part of his film career, Rathbone was generally cast as a romantic lead. He certainly fitted the traditional description of tall, dark, and handsome, but these roles did little to advance his career. Then in 1935 Rathbone's cold portrayal of Murdstone in David Copperfield caught the attention of producers, who subsequently cast him as the heavy in such films as Anna Karenina , A Tale of Two Cities and Captain Blood . Perhaps his most famous villainous role was Sir Guy de Gisbourne in The Adventures of Robin Hood . 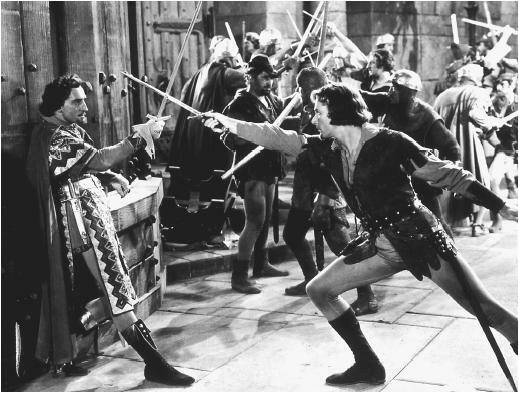 For this role (and similar ones) Rathbone studied fencing and became quite an excellent swordsman, which made his portrayals still more convincing. Although being typecast as a villain brought Rathbone a great deal of work and success, he felt the need to break out of that mold. In 1939 Rathbone changed his image when he portrayed Sherlock Holmes in The Hound of the Baskervilles . In many ways Basil Rathbone was the definitive Sherlock Holmes—he not only fit Conan Doyle's description of the character, but also played the part with precision and sincerity. Rathbone portrayed Holmes in 14 films (he also played the part on radio and on the stage). Although the series was very successful, Rathbone soon discovered that his association with the Sherlock Holmes character was even more constricting than his earlier identity as a villain. Finding it increasingly difficult to get acceptable film roles, in 1946 Rathbone acted on the New York stage in an attempt to escape his typecasting problems. He returned to Hollywood eight years later, only to discover that he had not quite escaped being typecast, continuing to play villains in such films as We're No Angels and The Last Hurrah . One especially memorable film from this period was The Court Jester in which Rathbone combined all the best elements from his earlier dastardly roles to create the consummate adversary for Danny Kaye. Rathbone's final few roles were in mainly low-budget horror films. While two of these, Tales of Terror and The Comedy of Terrors , have become cult favorites, others are best forgotten. It is a pity that Rathbone's career should end on such a note, for the actor was capable of so much more. His earlier films showed great versatility when he was allowed the opportunity to play varied and challenging roles. Nevertheless, it is a tribute to his acting ability that he is so strongly associated with two quite opposite roles, both the classical screen villain and the ultimate proponent of law and justice, Sherlock Holmes.